"The people of Lake Macquarie are starting to wonder what the State Government will take away from them next. They're also starting to wonder what the 'service' in Service NSW means, because they're certainly not getting much." Mr GREG PIPER ( Lake Macquarie ) ( 12:38 ): The people of Lake Macquarie are starting to wonder what the Government will take away from them next. They are also starting to wonder what the "service" in Service NSW means, because they are certainly not getting very much from the State's bureaucracy despite the apparent good intentions of the Government and some senior Ministers. 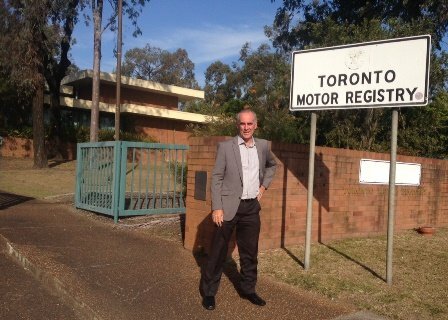 In October 2015 I presented to the Parliament a petition from more than 11,000 people who were outraged that the State Government was about to close the Toronto Motor Registry. The Government's new one-stop-shop model of providing services to the people of this State, as I noted at the time, inarguably has many good elements, but the decision to locate that Service NSW shop at Warners Bay was wrong. The site has very poor public transport access and is located in the extreme north of my electorate. People from suburbs such as Morisset, Bonnells Bay, Cooranbong and Mandalong can face a round trip of close to 70 kilometres to visit the Warners Bay outlet. I understand that the Government wants people to use online options, but for those who need to or who choose to attend in person, the location of the Warners Bay centre can mean the loss of considerable time to renew a licence or to undertake some other one-off transaction. It is worse still for those who need to use public transport. If someone needed to travel to Warners Bay from Bonnells Bay they would face a round trip of almost six hours, with as many as 10 bus and train interchanges. On behalf of this community, I lobbied hard for a Service NSW office to be located at Toronto or Morisset, where the vast majority of the local population lives, and which are well serviced by public transport. We lost that fight, but the State Government and the then Minister for Finance, Dominic Perrottet, to their credit, agreed to install a smaller-scale Service NSW kiosk at Toronto Library. Despite being staffed and open for only a few hours a day, the kiosk was still servicing dozens of customers each morning. It should be borne in mind that this kiosk was not set up with the most basic of modern facilities such as EFTPOS. If ever there was evidence that kiosks were designed to fail, it is the lack of EFTPOS. However, we lived in hope that we would see services at this kiosk expanded in the future. In May this year I was advised that the kiosk would be closed. I sought meetings with the new Finance Minister, Victor Dominello, who arranged for me to meet with senior Service NSW managers. Those meetings seemed positive and offered some hope that options would be explored to find a way of keeping a Service NSW presence in Toronto. Indeed, the senior Service NSW staff undertook to consider options and come back to me soon after. That never happened. Instead, the kiosk was closed without any further discussion and without any explanation to the local community. It seemed that regardless of the intentions of the Ministers involved, Service NSW was intent on closing the kiosk and would deny it any chance of succeeding or being expanded. I have held several discussions with the Minister and Service NSW since and they are certainly aware of my views and the anger in the local community. Following those meetings, I was further advised by Service NSW that it was now considering the installation of kiosks at Toronto, Morisset and in the neighbouring electorate of Swansea. After discussions with Service NSW, I mistakenly formed the opinion that these kiosks would operate in a similar way to the original one at Toronto but would be operated by Lake Macquarie City Council staff. I later learned that these kiosks were to be nothing more than unmanned computer terminals offering little more than would a home computer; they do not allow people to renew licences and they are not equipped with EFTPOS. As I indicated earlier, we do not have a fundamental problem with the Service NSW one-stop-shop concept—in many ways it is an excellent model. But we do have a problem with it being located at Warners Bay, bringing great inconvenience to many people. There are ample good locations available at Toronto—a place where people do their grocery shopping, visit the doctors and access many other services, but not government services because they are located a half?hour drive away in a bulky goods retail area at Warners Bay. The motor registry at Toronto offered people a good service but it was taken away. The kiosk which replaced it offered a modest service, but it too has been taken away. The kiosk that was provided through the good grace of the then Minister, Dominic Perrottet, had minimum cost to the budget of Service NSW. One staff member was deployed from some 12 kilometres away to service that kiosk for four hours a day, and I cannot understand how the Government can be looking for savings by taking that modest service away. If the Government is serious about improving services to the people of this State it should provide them in areas where people can easily access them. I call on the Minister to reconsider Service NSW in Lake Macquarie and bring full service to Toronto or the growing area of Morisset.